Shuck the corn by pulling the leaves of the husk (a few at a time) down and away from the ear and gather them in a bundle beneath the stem to form a handle. Next, pull off the silk with your fingers. Don’t worry if you don’t get them all. They will burn off over the fire. Using a basting brush, lightly brush each ear with olive oil, vegetable oil, or melted butter and season with coarse salt (kosher or sea salt) and freshly ground black pepper. Lightly is the operative word here: excessive oil will burn, producing a sooty residue on your corn. Make a grill shield: Fold an 18-inch sheet of aluminum foil into thirds like a business letter. Set up your grill for direct grilling and preheat to high. Lay the grill shield on the grill grate along the front edge and arrange the corn on the grate with the husk handles over the shield. 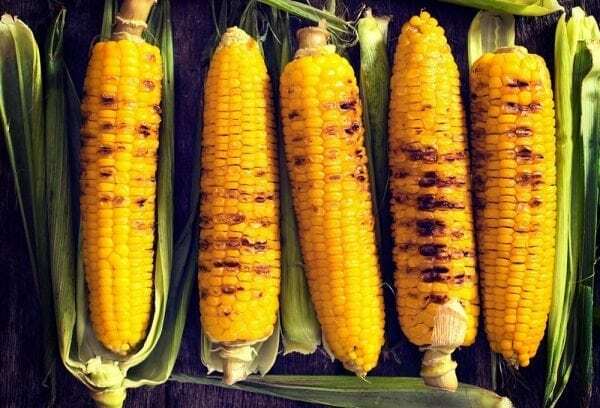 Grill the corn until the kernels are thoroughly browned, 2 to 3 minutes per side, 8 to 12 minutes in all, turning as needed. Remove the corn from the grill, slather with more butter (or one of the following toppings), and dig in. Northern Italian Style - Brush with extra virgin olive oil and sprinkle with freshly grated Parmigiano-Reggiano cheese. Spanish Style - Brush with extra virgin olive oil and sprinkle with pimentón (Spanish smoked paprika) and salt. Scandinavian Style - Brush with melted butter and slather with sour cream. Sprinkle with chopped fresh dill, salt, and pepper. Buffalo Style - Brush with melted butter and Frank’s® RedHot® or Crystal hot sauce. Sprinkle with crumbled blue cheese. Thai Style - Brush with melted butter and sriracha. Sprinkle with chopped cilantro and toasted peanuts.